Lined up to be the first disappointment in what has been an amazing World Cup so far, the clash between England and Italy ended up being surprisingly watchable. The Italians are traditionally slow starters and Roy Hodgson has rarely alternated from two passive banks of four in his long coaching career. There was a surprise in the England line-up however. Not simply that the widely-recommended Raheem Sterling was starting, but that he was starting in the central attacking midfield role he stood out in at Liverpool. Although more attacking, Sterling wouldn’t look out of place as a winger in a typical Hodgson side, but playing him through the middle gives an extra verve and danger to the side rarely seen under his coaching. Sterling was not alone – Liverpool’s success was taken advantage of by adopting their quick attackingÂ and energetic attempts to win the ball back, best exemplified by Daniel Sturridge’s goal. 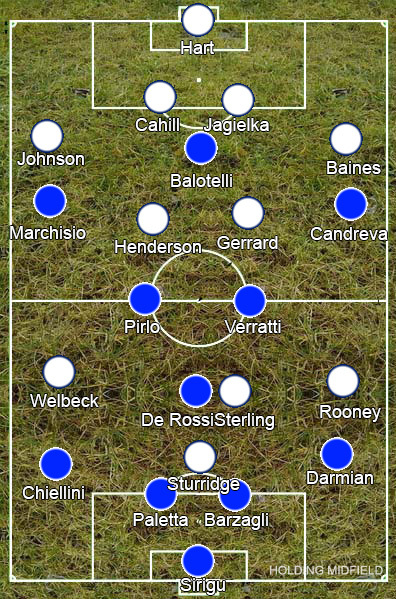 By contrast, Italy probably got their line-up wrong. Two years ago, Andrea Pirlo ran the game against England unmarked in front of the Italian defence. This time around, that deeper midfield spot was cycled between him, Daniele De Rossi and, heir to Pirlo’s playmaking role, Marco Verratti, leaving the midfield a touch lightweight to have to deal with Sterling’s, and later Ross Barkley’s, direct runs and no one really in command of orchestrating play. England’s energy in attack also led to several poor misplaced passes deep in the Italian half. These three playing so deep did however open up pockets of space behind the England midfield for Claudio Marchisio and Antonio Candreva to take advantage of. The latter found great success taking on Leighton Baines, especially with Matteo Darmian racing up to support him untracked by Wayne Rooney on the left wing. This was how Italy got their winning goal and the majority of their chances, yet it also led to England’s equaliser: Darmian attacked and Rooney stayed up the pitch, Sterling picked out a fantastic ball, Darmian couldn’t get back in time and Rooney put in a great cross for Daniel Sturridge to finish first time. Danny Welbeck, who had a good game, and Wayne Rooney swapped sides to keep track of Darmian only to be hauled off for Barkley, who offered the same direct running as Sterling. The addition of Jack Wilshere in midfield also made sense as his willingness to drive at players can be beneficial against packed midfields, but he’s so out of form the substitution was a waste. Eventually, the still energetic Sterling was moved out wide as Rooney moved into the middle with little success – the Manchester United striker remains England’s most frustrating player, squandering several opportunities. The Italians rarely looked like giving up their lead a second time however. Thiago Motta was brought on to solidify the midfield as they dropped back and left England to try and score as they passed around them. More than happy to play up to stereotypes. It was a surprisingly upbeat performance from an England team that has rarely looked much fun, but Italy didn’t look particularly good and the glaring defensive weakness down their left side exposed here and in the warm-up games must worry England, cursing the decision to leave Ashley Cole at home.